Home &sol; Attention car navigation users! recently, an increasing number of guests have encountered problems when using the Ichinoi phone number to set the destination in their car navigation system. In order to avoid this problem, please use the map and information below. Once you arrive in Kurokawa on Route 442, enter the village and cross the bridge. At this point, your navigation system will instruct you to turn right (red route). This will lead you on a circuitous and narrow road through the mountains. Please avoid this road. 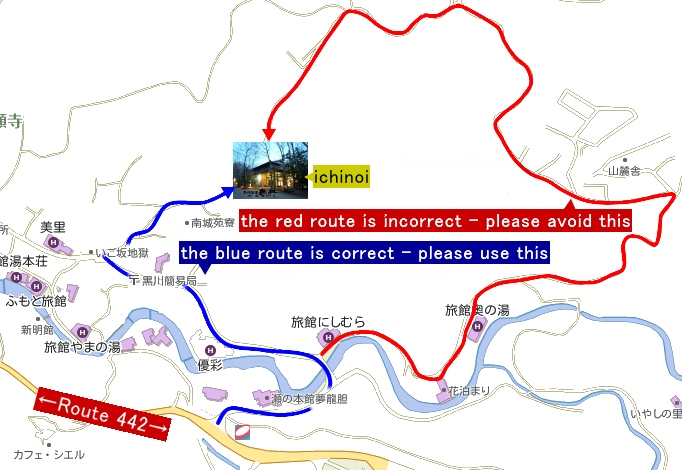 Instead, after crossing the bridge please continue straight through town toward the information center (blue route). 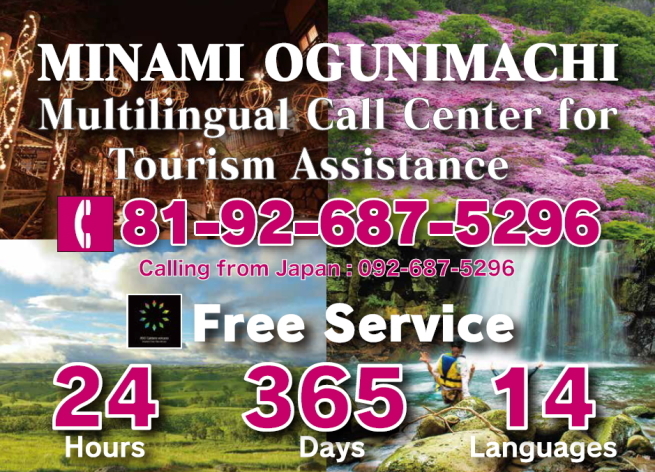 In fact, instead of using the Ichinoi phone number, you can enter the information center phone number (0967-44-0076) in your navigation system. Once you reach the information center, either ask for directions at the information center, or turn right on the hairpin immediately after the information center. The road to Ichinoi is narrow in places, but nearly all cars can easily pass, which include rental cars. However, if you believe your car may be too wide to reach us, please park at the information center and give us a call (0967-44-0881). Copyright © 2019 kurokawaonsen ryokan ichinoi. All rights reserved.